Meat from cattle, sheep, pigs, goats, etc., forms an important part of the diet in many countries. There are many different ways of cooking and preparing meat. Beef Bourguignon (French: Bœuf bourguignon) - This French dish is a beef stew cooked in red wine, flavored with garlic and herbs, carrots, onions and lardons (bacon from the back fat of a pig), and then garnished with onions and mushrooms. 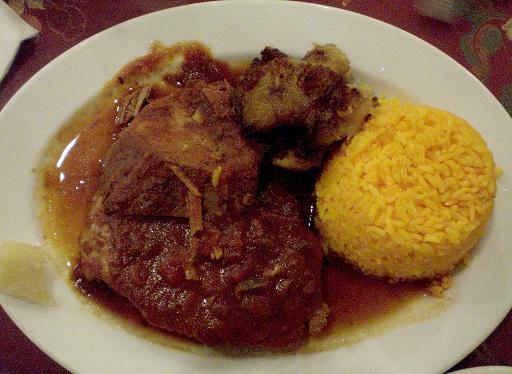 Boliche - This is popular Cuban recipe is a beef eye round roast stuffed with chorizo, all in a tomato sauce. Beef Stroganoff - This is a Russian dish, although it probably has Franco-Russian origins (i.e. was probably invented by a French chef working for Russian nobility). The dish consists of sautéed pieces of beef served in a sauce with sour cream. Biltong - This is a South African dish similar to jerky. It is made from salted dried meat such as beef or from game. Bratwurst - German cuisine is well known for its sausages. Bratwurst a type of sausage made from beef, pork or veal. They are often eaten with mustard and ketchup, and can also be used as an ingredient in other dishes. Chili con carne - This is a dish found in Mexican cuisine and Southwestern cuisine. It is a spicy stew made from ground beef and chile peppers. Some versions of the stew add beans, onion or tomato, but there are also many people who say that these "filler" ingredients should not be added. Döner kebap - This is a recipe from Turkish cuisine which has become popular as a fast-food all over the world. The dish is made by cooking meat on a rotating spit (in Turkish, döner kebap means "turning roast"(. The meat is usually served in a pide (Turkish pita bread), and in the fast-food version (originally invented by the the Turkish community resident in Germany), salad is placed in the bread as well. Kibbeh - This dish is found in Israeli cuisine and Lebanese cuisine. 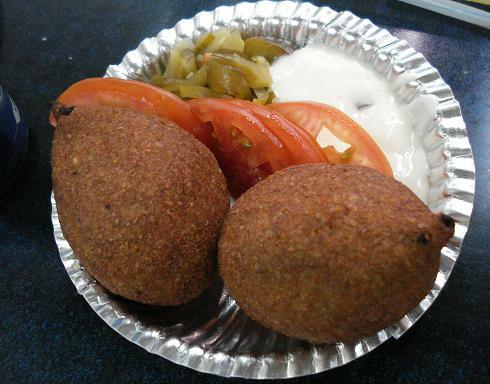 It is made from ground meat, flour and spices, which are made into a ball and then fried. Kleftiko - This is a famous Greek recipe that is made by marinating lamb in garlic and lemon, and then slowly cooking it in a pit oven. The dish is named for the "klephts" (literally "thieves"), and hence kleftiko is the "meat of thieves". It should be noted that in this context, "thieves" has a positive association (similar to Robin Hood), as it refers to bandits and others who were resisted Ottoman rule over Greece (which lasted from the mid-15th to the early 19th century), and went on to participate in the Greek War of Independence (1821 to 1829). Liver mush - Liver mush is a food stuff used in Southern cuisine, and particularly popular in North Carolina. It is made from pig liver with cornmeal, flavored with pepper and sage, and is in a loaf shape. Slices are cut from the loaf, and then cooked ina skillet or used as an ingredient in other dishes, including omelettes and even pizzas. 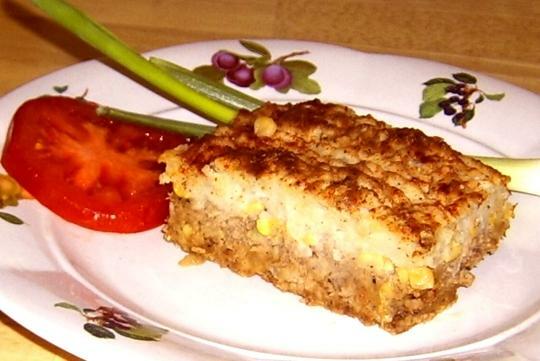 Meatloaf - This is originally a Midwestern dish, but has become popular throughout the whole United States. It is made from seasoned ground meat, shaped into a loaf and then baked. Beef is usually used to make the dish, but pork or veal are alternative choices. Meatloaf is can be served with gravy, tomato sauce, or barbecue sauce. 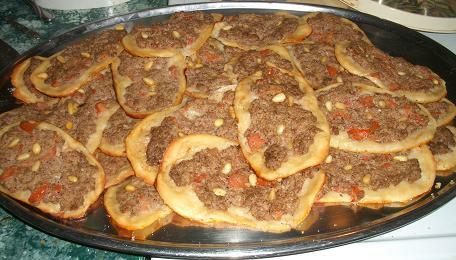 Sfiha - This is an Arab recipe (originally from Syria) for open (there is no dough on top) meat pies. Shepherd's pie - This is a British recipe made from ground ("minced") lamb, covered with a layer of mashed potato (and sometimes cheese), and then cooked in the oven. Instead of lamb, the dish can also be made using ground ("minced") beef, in which case it is usually known as "cottage pie". 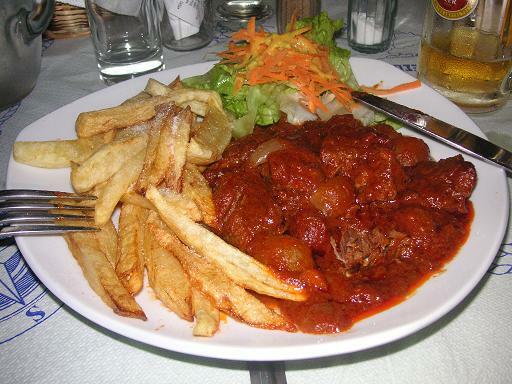 Stifado - A classic of Greek cuisine and Cypriot cuisine. Stifado is a beef, tomato and onion stew, flavored with red wine. Wiener schnitzel - This Austrian dish's name, translated from German, means "Viennese cutlet". It is made by dipping thin slices of meat (veal traditionally but other meats are nowadays often used) in a wheat flour, eggs and bread crumbs, and then deep-frying. Wiener schnitzel is usually served with a slice of lemon and a potato salad. Our Barbecue Is Great! Learn How To Slow Smoke Meats Right. Mouth Watering Competition Style. 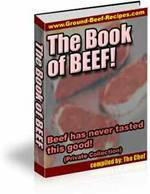 1,250 Juicy, Beef Recipes In 5 Downloadable Cookbooks! Secret Download Link To Over One Million Free Recipes!